The dentists and staff at Redlands Dental Group and Orthodontics are committed to understanding and meeting your needs as a patient. They take great pride in providing professional excellence, the best quality materials, and state-of-the-art equipment. Their high tech equipment makes them one of the most technologically advanced offices in the area. They have intra-oral cameras, which allow us to view your teeth on a flat-screen monitor directly in front of you, and digital X-rays, which emit 90% less radiation than standard X-rays. For those a little timid, at Redlands Dental Group and Orthodontics you can distract yourself and watch a movie while you’re being treated. The technology allows them to be more accurate and efficient with your dental care, which enables them to provide the best dentistry at an affordable cost to you. The friendly and knowledgeable staff is committed to understanding and meeting your needs as a patient and to keep your teeth looking their best. From comprehensive dental services, cleanings to exams to crowns and braces, Redlands Dental Group can meet all of your dental needs. 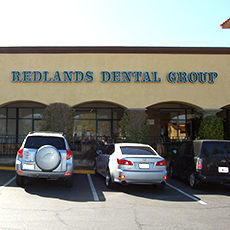 Located at 422 Orange Street, Redlands Dental Group offers convenient hours for after work and weekend appointments. Call the professional smile makers at Redlands Dental Group at 909-792-7500 or log on to www.redlandsdentalgroup.com to make an appointment.